Ballinlough breezed through this Intermediate cup quarter final against neighbours Carnaross in Moylagh on Sunday, to cap off a great few days on the field for the North Meath club. The sun shone on the field as the ‘Lough put in a sparkling performance to announce themselves as serious contenders for the trophy in its inaugural year. In truth, the outcome of this contest was clear after the opening minutes saw the ‘Reds open up a commanding lead. Ex-County man, Peadar Byrne opened the scoring after a powerful run through the Carnaross defence. Sean Geraghty quickly added to this, before Niall Farrelly announced his return to the starting fifteen with a well finished point after a great pass from Colm Mallen. Ronan McGuinness increased the ‘Lough’s lead to four points shortly after, capping off a very impressive opening five minutes for his side. Pearse Fleming, who looks like a great prospect for the future, opened Carnaross’s account in the tenth minute with a great score from distance. The game then saw it’s most barren spell as neither side managed to register a score for the following ten minutes. After a few poor misses by the Reds, Cian Mallen got them back on track, handpassing over the bar after a good team move. His younger brother Colm, scored from a tight angle soon after, before Sean Geraghty got his second of the day after a great run forward from lively half back Johnny Reilly. Shane Caserly and Fleming picked up points for the ‘Ross before the break to reduce the deficit. But the half was brought to a close by Byrne, who split the posts after some patient build up around the middle of the field. Young forward Jack Tunney was introduced at half time and had an instant impact when he put the ball over the crossbar within minutes. Byrne tagged on a well taken free kick, before Johnny Reilly scored a great point from far out after a great team move involving Cian Mallen, Ronan McGuinness and Byrne. Colm Mallen and Byrne converted back to back frees before Lorcan Maguire announced his arrival on the field with a fantastic point. 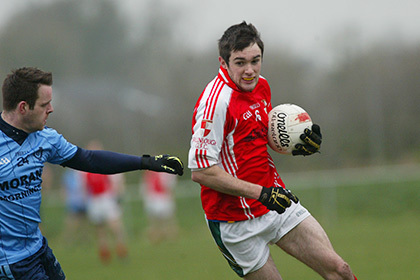 John L Magee registered a brace of points for Carnaross to briefly bring the Ballinlough onslaught to a standstill. Steven Flaherty secured one additional consolation score for the Ross, before Tunney closed the game out with a further brace of points to give his side a fourteen point victory. The ‘Lough will be delighted to see their good form continue, and will hope it last’s into the business end of the year when the silverware is handed out. Best for the winners on the day were Podge Muldoon, Johnny Reilly, Peadar Byrne, Colm Mallen, Sean Geraghty and Jack Tunney. Ballinlough: K. McGuinness, B. Smith, P. Muldoon, R. Farrell, Johnathan O’Reilly, M. Geraghty, Johnny Reilly (0-01), P. Byrne (0-05), D. Muldoon, Colm Mallen (0-02), R. McGuinness (0-01), Cian Mallen (0-01), S. Geraghty (0-02), T. McCullen, N. Farrelly (0-01). Subs: J. Tunney (0-03) for N. Farrelly, L. Maguire (0-01) for J. Reilly, M. McCullen (1-00) for R. McGuinness, E. Smith for B. Smith, L. Gibney for K. McGuinness, K. Devine for T. McCullen.